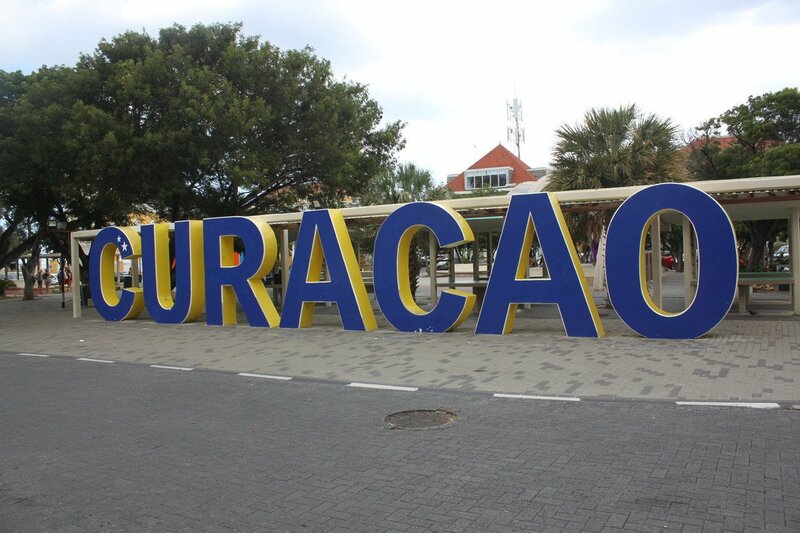 Today kicked off the bulk of our Southern Caribbean cruise, with our port stop in Curacao. I have never been here before and I was excited to see what this island has to offer. We set the alarm for 7am and got the family prepped and fed prior to disembarking at almost exactly 9am. 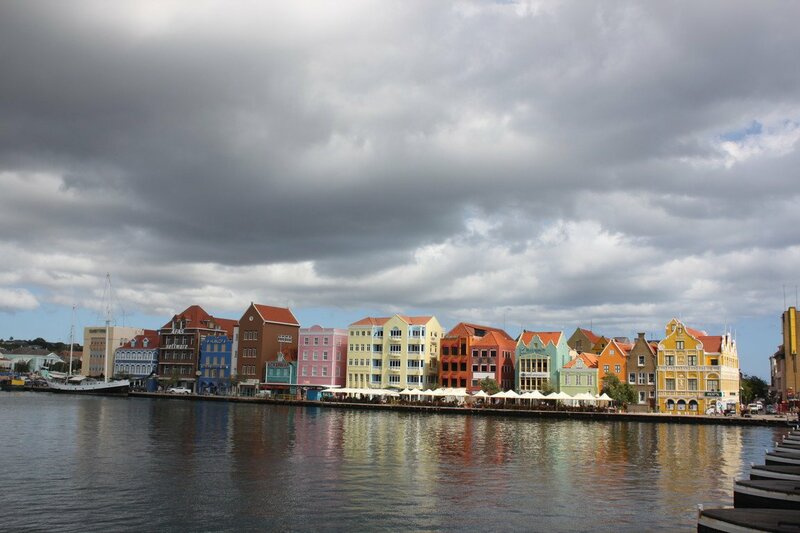 As the ship pulled into port, Curacao was revealed to us and the closer we got, the more beautiful it became. The color of the water was just amazing. We had booked a Private Journeys excursion through Royal Caribbean, which is a Royal Caribbean excursion that allows for complete customization. It started off almost like any other Royal Caribbean excursion, with heading to the tours area of the pier and meeting our driver. Instead of a bus full of other guests, it was just us. Our tour guide was actually two ladies, one of which worked for a local tour company. Her friend did the driving and she provided the actual tour, with commentary all along the way. 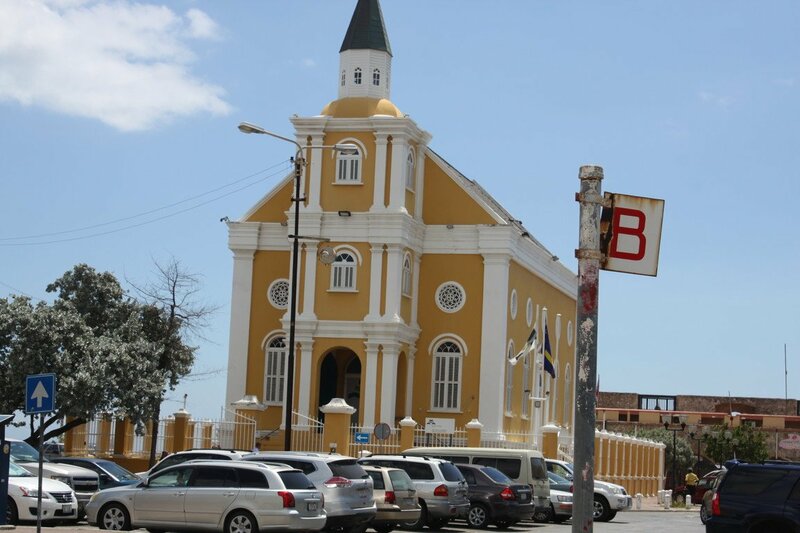 We drove around Curacao in a late model SUV that had plenty of air conditioning (something never to be overlooked). Prior to the cruise, I had negotiated with Royal Caribbean directly as to what we would be seeing and doing. 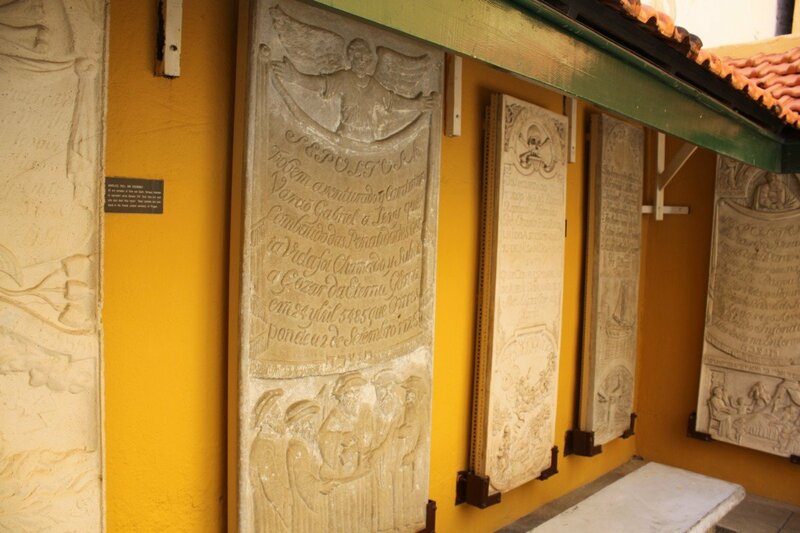 I had essentially listed a half-dozen historical Jewish spots around the island and was good with that as our itinerary. When we met our driver, she informed us we would be doing all of that and would also have a tour of the island’s west side included too. Score! One of my concerns about the excursion was we were just getting a glorified taxi driver, but our guide knew her stuff. 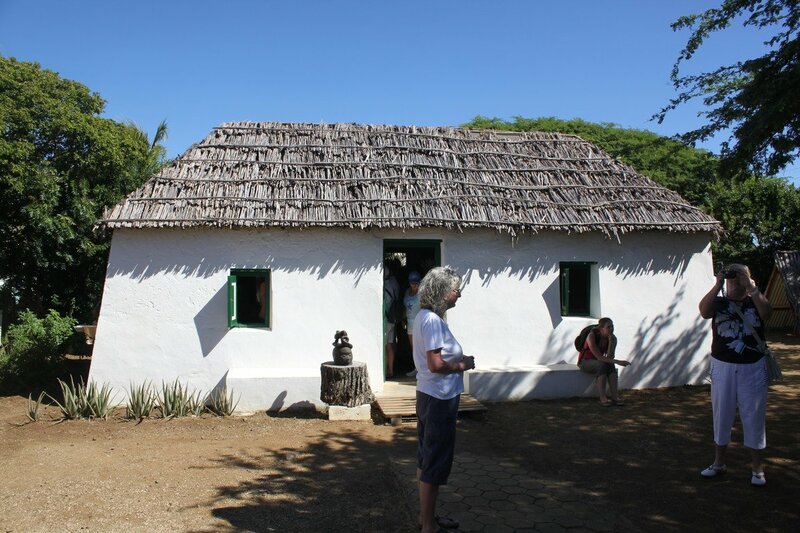 She seemed to know the history of every inch of the island, and when it came to the Jewish cultural sites, she knew the history of it all. The plan was to start off with a tour of the western half of the island, and then return to Williamsted to see the sites. The western half of the island is quite beautiful, and much more sparsely populated. We stopped at various historical and cultural spots. 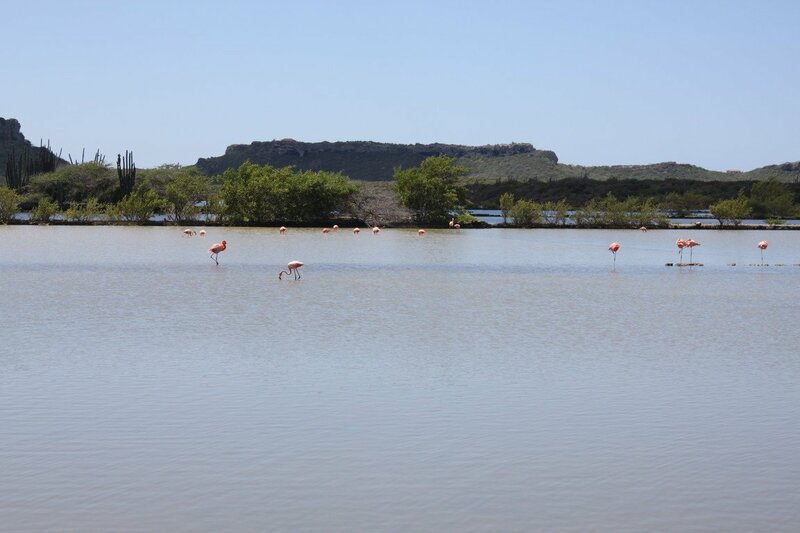 We saw stunning beaches, monuments to the history of slavery and the highlight of seeing wild flamingos. Our tour guide even prepared for us pumpkin pancakes, which were terrific. 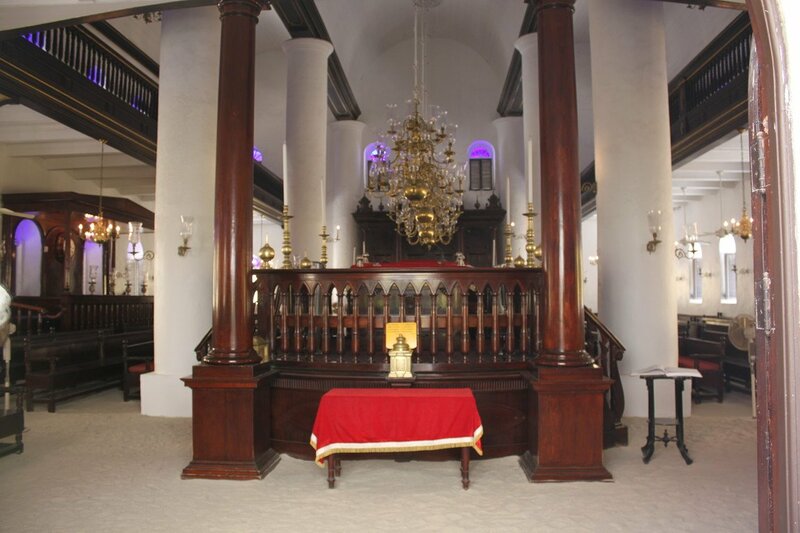 A few hours in, we saw the historic Jewish sites of Curacao, including the Sephardic and Ashkenazi temples. 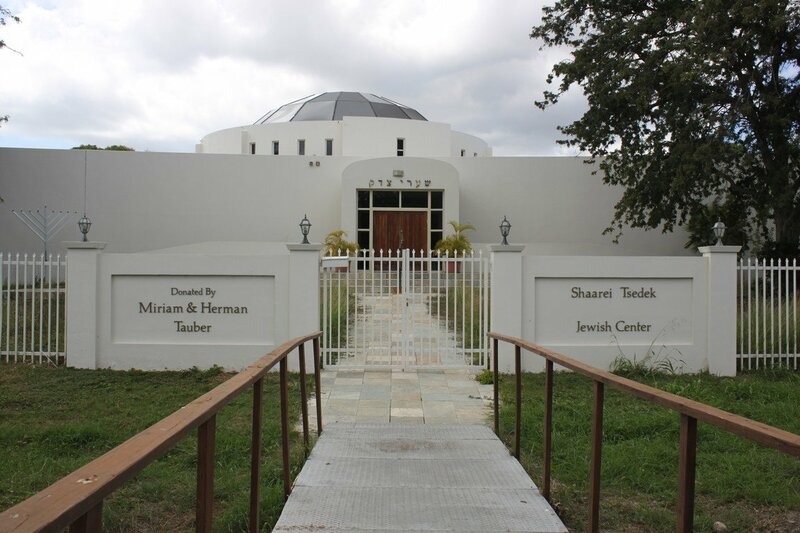 We also made a stop at a Jewish cemetery and the house of a prominent Jewish artist. I will write a full post about my Private Journeys excursion in the future, but overall I was quite satisfied with the experience. If I could do it over again, I would have reversed the itinerary and started with the Jewish sites first and then worked in the tour, but hindsight is 20/20. Following the tour, my kids and wife wanted to head back to the ship so I went back with them to the room. The allure of exploring Williamsted some more was too enticing and I headed back into town on my own. 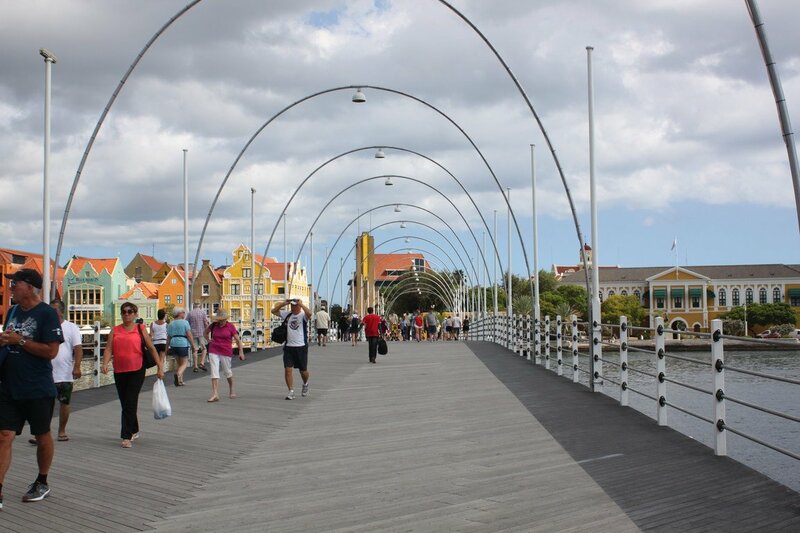 The walk from ship to town is a short 10 minute walk along a nice waterfront walkaway. It culminates with a walk across a pontoon bridge, before arriving in downtown Williamsted. 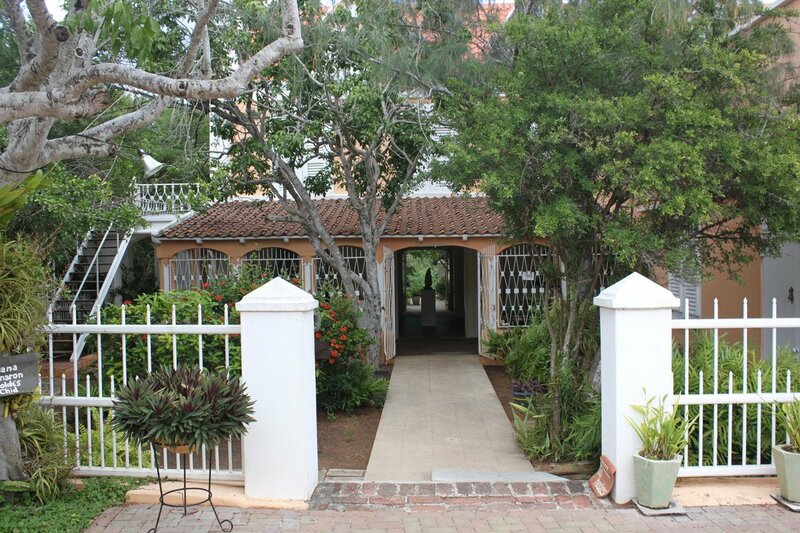 Williamsted can best be described as a more affordable Grand Cayman. Well-manicured, lots of shopping and dining but without that premium price tag. I really wanted to get a local cell phone provider SIM card for my phone to use so that I would not feel tethered to WiFi spots. I found a small shop that helped me set it all up and they assured me that it would well in Curacao and Bonaire (might have an issue in Aruba, but TBD). The SIM card and 3 GB of data cost me $45, and while the live streaming performance of the data plan might not be the same as in the United States, it was lovely having a fast connection for social media around town and even while onboard. 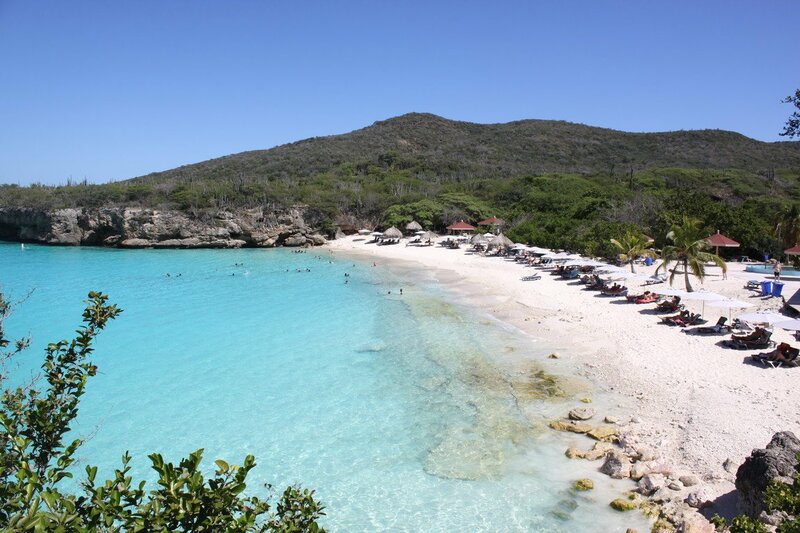 If you are looking for a recommendation for what to do in Curacao, I would recommend going to Williamsted for the morning and then take a taxi to a beach for the afternoon. There are plenty of taxis and the city and countryside offer a lot to do. Back onboard Navigator of the Seas, I cleaned up for dinner. My wife and I decided to make reservations for Giovanni’s Table for dinner on a whim and were able to get the exact time we wanted. 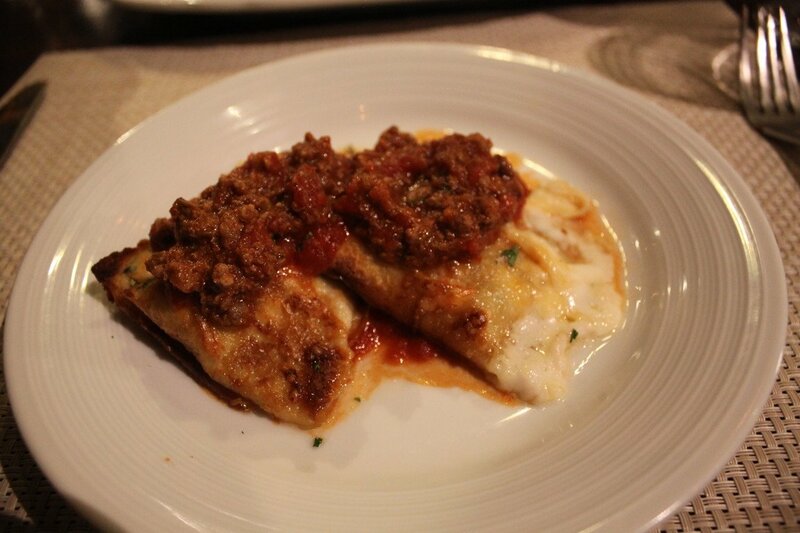 Giovanni’s Table was quite good and I fell in love with the cheese and spinach crepes that came served in a bolognese sauce. Wish I had asked for a second helping of that. 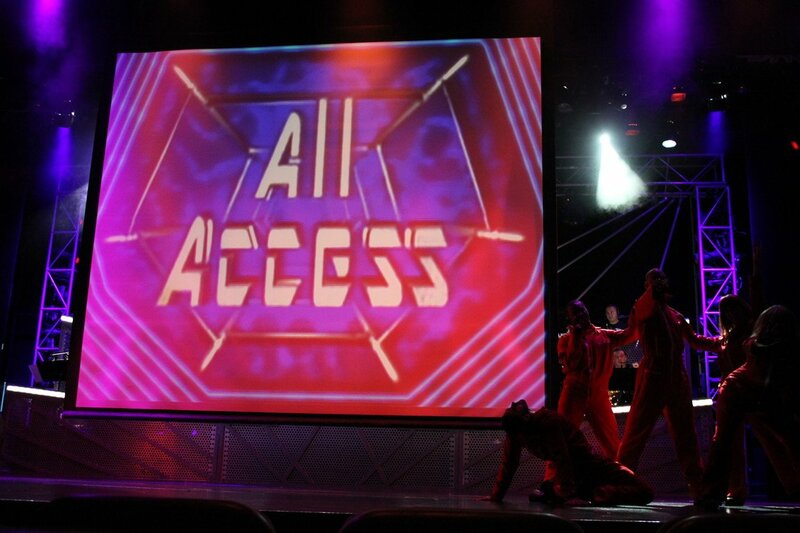 Our after dinner entertainment was the show, All Access, which is a medley of pop hits from the 60s, 70s, 80s and 90s. It was the kind of show that you would sing along to as the cast put a lot of energy into their performance. Tomorrow we are headed to nearby Aruba for a day of exploring with my friends onboard the cruise with me. Once we got everyone up and changed, we had breakfast in the Windjammer. One of the nice things about Navigator of the Seas is even though we rolled in for breakfast around 9am, there was still plenty of seating available. In addition, I like the added international foods that I have seen in the Windjammer on this seating. This morning we held a very fun event in the Conference Center for the folks in the Royal Caribbean Blog Group Cruise. It’s our version of the 1970’s game show, Match Game. In our version, we made it Royal Caribbean themed and I think we all had a blast. We had a few rounds of Match Game, with Sheila ultimately winning the game and coming home with a lovely $75 onboard credit prize, courtesy of MEI Travel. As I mentioned in yesterday’s blog post, the we changed time zones at 11am, so that meant there was no 11:00 hour, and at 10:59am, we went straight to noon. My oldest daughter wanted Johnny Rockets for lunch, so we decided to give that a try. Johnny Rockets across all Royal Caribbean ships is an incredibly consistent experience. 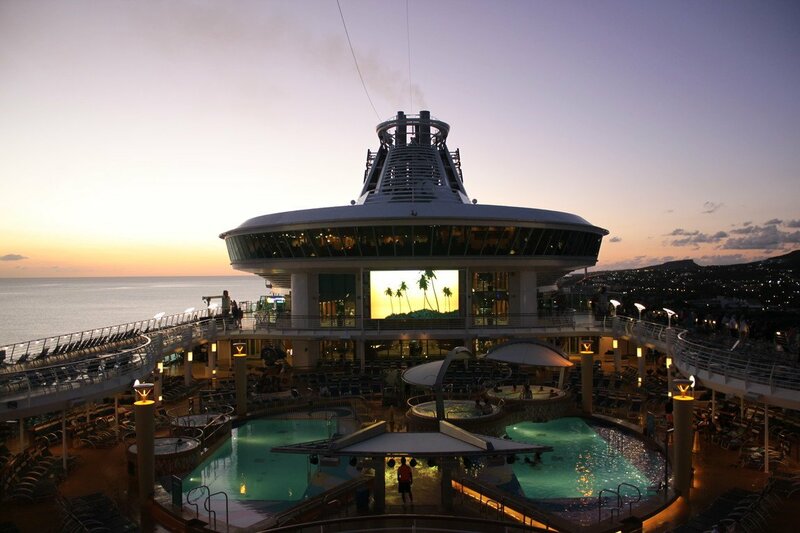 Whether it is Navigator of the Seas or Freedom of the Seas or Harmony of the Seas, they are very similar experiences. There was a quick turnaround for the next event, which was something we called “GuacFest.” We rented out Sabor and provided guacamole, chips, salsa and some other appetizers for everyone that booked into the group cruise free of charge. I feel if folks support RoyalCaribbeanBlog.com and come to our events and support our sponsors, I want to turn around and support them. Holding fun events like this are a great way to do just that. The kids went up to Adventure Ocean for the afternoon and my wife went to see the ice skating show in Studio B ice skating rink, while I went with some friends to visual trivia in the Schooner Bar. Visual trivia means you get a sheet of logos and have a fixed amount of time to correctly identify them all. There were 50 and we got 46 correct, but sadly missed out to the winning team that scored 48 correct answers. As afternoon began to turn to evening, I collected the children and headed back to the room to get ready for dinner. Losing that one hour in the morning really made this day seem like it was over in a flash. Tonight was the Top Tier Crown and Anchor Society welcome back party, where guests that are Platinum or above are invited for a special event to thank them for their loyalty. It was held in Studio B, and I really enjoy the fact Royal Caribbean takes time out of the cruise to thank its most loyal customers. We headed to the main dining room for dinner, which was another great meal all around. I usually do not order dessert unless it is coffee ice cream. Tonight, this was my dessert. Following dinner it was time for some evening entertainment. We started out in the Pub and then saw the Love and Marriage game show in the Royal Theater. Love and Marriage is a classic show, and the couples this evening did not disappoint. The old couple, in particular, were very funny. The Diamond discount for internet is valued at 24 hour access (1 day) of Voom Surf. That means 1 day of Voom Surf & Stream costs $8 out of pocket with the Diamond coupon applied. The lesson learned from this is it is a better value to pre-pay for any Internet package before the cruise. I can vouch there is lots of waiters available at the various bars, especially the pool deck. We spoke to the head waiter after noticing the assistant waiter was taking bar orders in lieu of the bar waiter. Evidently there is a change happening across the fleet to remove the bar waiter and let the assistant waiter grab the drinks. The reasoning is the bar manager had to cover a vast area, and that lead to gaps between visits for refills. Also, the assistant waiter taking drink orders has lead to significantly more sales. If you are still not sold on the idea, the head waiter did note that any land-based restaurant has the waiter taking drink orders. I spoke to Navigator of the Seas’ Food and Beverage manager about the change to having the guacamole made in the kitchen (instead of tableside). The change was precipitated by recommendation by the U.S. Department of Public Health. I then mentioned that land-based restaurants do it all the time, and they pointed out cruise ships are under a different set of rules compared to land restaurants. While I prefer tableside guacamole, the final product remains the same. Trying to figure out if the Golf Simulator onboard is still there and is actually open. There are signs, like this one, but was not around when a crew member was present to ask. The mystery continues. 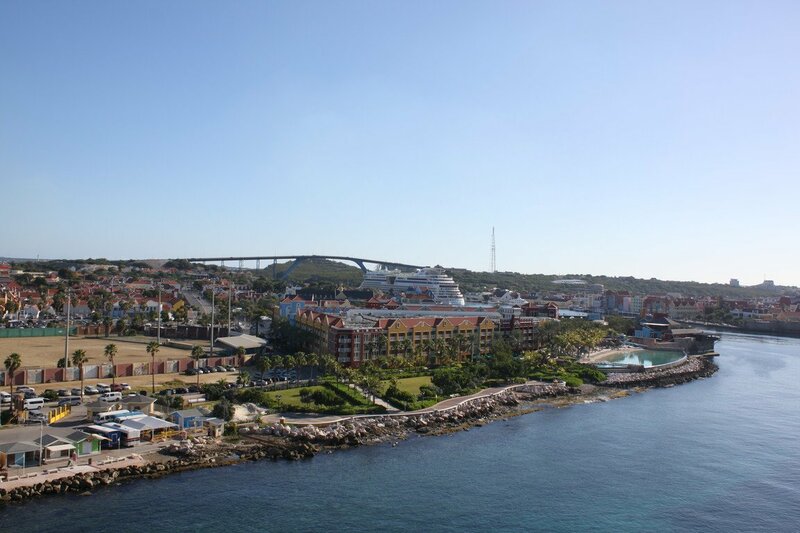 Tomorrow is a port day, and we will be visiting Curacao. Our first port stop on this nine-night cruise is Royal Caribbean's private destination of Labadee. It is one of my favorite spots in the Caribbean, and I was looking forward to a really fun day at the beach with the family. Our ship docked at 7am in Labadee, and that is also what time we decided to set the alarm for to ensure we get started early. While my wife rounded up the kids and got them ready, I ran upstairs to the Windjammer to bring back breakfast for everyone. I grabbed the usual cheerios, bagels and fruit for the family and I got for myself a vegetable curry. I am really liking the greater breakfast variety in the Windjammer! We got off the ship around 8am or so and made our way to Barefoot Beach. Barefoot Beach is reserved for suite and Pinnacle guests and since we are staying in a Grand Suite on Navigator of the Seas, we have access to this beach. We also decided to rent a beachfront cabana, primarily for the expansive area and service that it comes with. We have rented cabanas at Nellie's Beach for the past few cruises and have come to really like what they offer. Being that we are in a suite for this sailing, we decided to give the Barefoot Beach cabanas a try. The cabanas come with a private space, as well as towels, a cooler full of Evian water, waiter service, upgraded buffet and water floats. The beach front cabana cost $395 and accommodates up to six guests. That may sound like a lot, but when you break down the cost per person, per hour over the course of the day, I think it makes a lot of sense. Plus, it provides us somewhere for the kids to relax (and hopefully nap). We got settled into the cabana and went for a swim on a really beautiful day. It was partly cloudy and temperatures that started in the upper 70's and got up to perhaps in the low 80s. A perfect day for the beach. For what it's worth, the forecast online had a 40% chance of rain, but it was nothing but sunny and beautiful while we were there. The lesson learned is do not assume the forecast is definite, especially in the Caribbean. I joked with some friends that beach days make for very relaxing and fun times, but boring live blog posts. So I apologize I do not have more stories to regain you all with, but it was a great time. Keep in mind that any guest can reserve a cabana in Nellie's Beach, and the experience is nearly identical there to the Barefoot Beach cabanas (the only big difference is no upgraded buffet). All aboard time was 3:30pm, so we headed back to the ship around 2pm. I took my oldest daughter for a quick swim and snack back on the ship, while my wife took my youngest to nap back in the room. Afterwards, we switched off and my wife went to take a hot stone massage at the Vitality Spa while I took care of the kids in the room. Having the extra space with the suite (especially the balcony) really makes a difference when trying to keep the kids entertained onboard. Following the massage and showers for everyone, we fed the kids dinner and sent them up to Adventure Ocean. I skipped pre-dinner this evening, just because we had dinner lined up at Sabor and I need all the space in my stomach to accommodate the influx of super amazing guacamole that is headed my way. We had a few pre-dinner drinks at the Schooner Bar, which also had Abba trivia being held. Not being much more than an average Abba fan at best (as in I may hum along to a song of theirs on the radio), I did not think much of the idea, but the Schooner Bar was packed! As I mentioned, tonight we had dinner at Sabor. We managed to get Sabor for just $15 by pre-booking on Royal Caribbean's Cruise Planner. I can confirm that the guacamole is in fact being prepared in the kitchen now instead of tableside. The wait staff indicated the change was because of U.S. Health Regulations and not a company policy. The good news is the guacamole is still custom made to your taste and while I may prefer the tableside approach, I can live with the current method. As always, I will write a formal review of Sabor in a future blog post, but Sabor remains a great restaurant that I will return to again and again (including this sailing). We did spot one new feature at Sabor, which is a margarita flight called, "Three Amigos" which is a series three margaritas to enjoy (rather than ordering each individually). The cost is $18 and if you have a drink package, it is just a $6 surcharge. 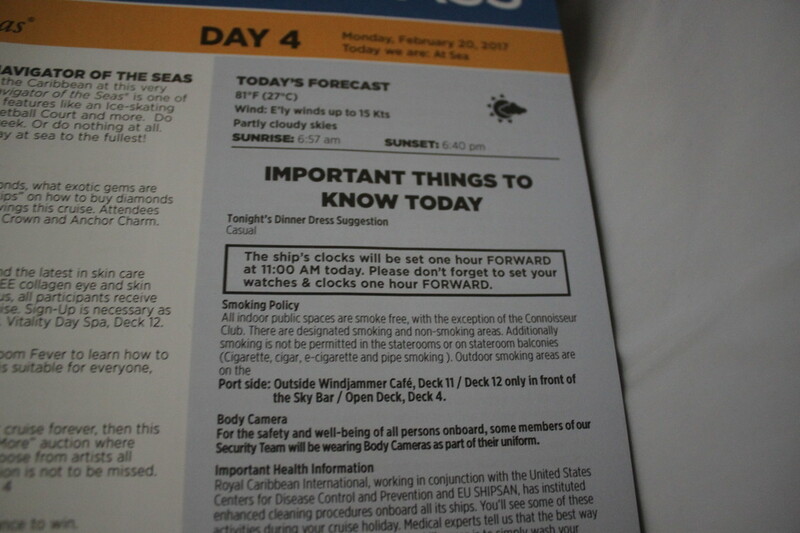 In the most bizarre event to occur to me on a cruise ever, we received a notice that tomorrow at 11am, clocks will move forward one hour. Not only is the time change occurring, but it's happening in the middle of the day (instead of at night) and that means there is no 11:00am hour. Very odd! There is no kids movie channel. Usually there is a channel with kids TV shows (which there is) and a kids movie channel (which there is not). I saw at the pool this afternoon a 10 minute massage for $20 offered. Not a terrible deal for a quick Swedish massage. There is complimentary transportation around Labadee that you should take advantage of. A tram can take you to all the beaches and you can hop on or off. Likewise, there is a one-way ferry that will take guests from the dock to Columbus Cove. You can get the official drink of Labadee, the Labadoozie, with or without a souvenir cup. The souvenir cup costs extra if you have an unlimited beverage package. The drink packages work on Labadee. 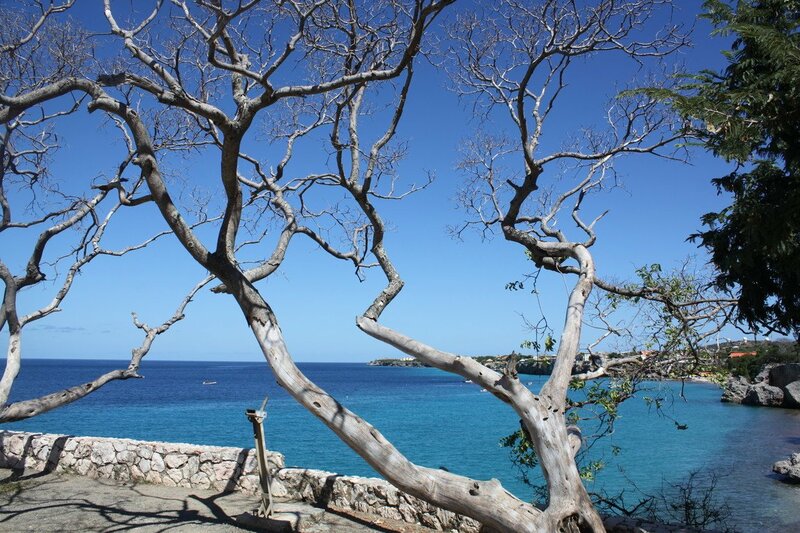 The beaches around Labadee offer different views, but the experience is quite similar. The further you go from the dock, the less crowded it can be. Johnny Rockets was offering a 20% off coupon for today only. Tomorrow is our second sea day and we have some fun activities planned (except during 11am). Our first full day on Navigator of the Seas and I started things off by sleeping in. I was so tired from not sleeping well the night before the cruise and not getting to bed until about 1am, that I needed to get a few extra hours of sleep to be semi-functional. My oldest daughter seemed to have the same idea, as she slept later than I did and we had to coax her to get her going too. For breakfast, we headed up to the Windjammer. It was about 9:45am, so we were hitting it at peak time, but the crowd was quite manageable. As usual, I opted for a custom made omelet and it hit the spot. We dropped the oldest daughter off at Adventure Ocean. She is six years old and it is her first time in the 6-8 year old group in Adventure Ocean. She had no issues last night, but this morning they mixed Voyagers (9-11) and Explorers and my daughter told the counselors she was not enjoying the antics of the largely boy-dominated group that was there. The staff allowed her to go down to Aquanauts (3-5) and she did quite well. When there are not a lot of children on a sailing, the groups are often merged, but this is the first time my daughter had any kind of issue with the mixing. I think she will end up with the Aquanauts since it is what she would prefer and we will give Explorers another shot on Anthem next month. My youngest daughter spent some time in the Optix teen club, where during the day there is open play toys for the toddlers to enjoy. She loved being in there and there were a few more toddlers for her to play with too. For lunch today, we decided to take advantage of our suite benefits and ordered the main dining room lunch menu to be delivered to our room. All we had to do was call room service and order off the lunch menu provided in our suite. It was wonderful letting the kids play in the room, but not compromise on the food my wife and I got to enjoy. 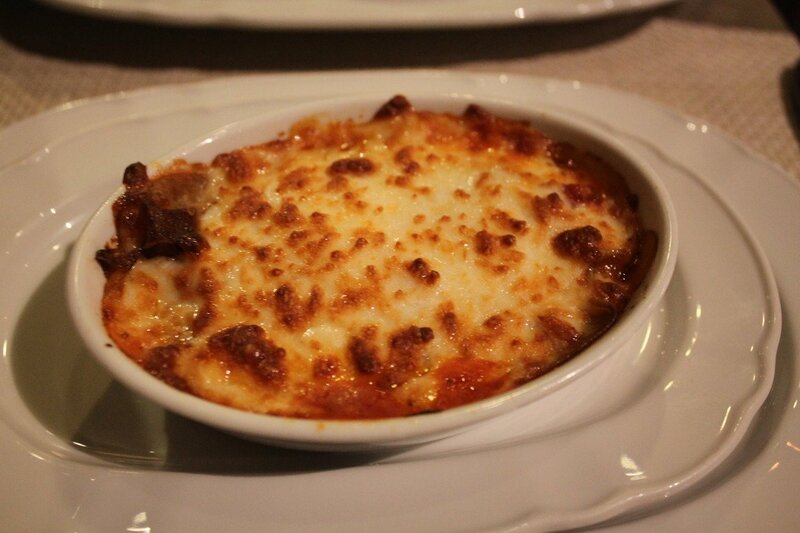 The turkey parmigiana was awesome! One of the oldest debates among cruisers is the decision to splurge for a stateroom with a balcony or not, and I believe if you have one, you spend more time in the room than if you do not. With that in mind, we spent our early afternoon enjoying a gorgeous day outside. It was sunny, high in the upper 70s and just a few clouds in the sky. By about 2pm, Adventure Ocean reopened, so I brought my oldest daughter up to Adventure Ocean while my wife let the little one nap. This afternoon was our Group Cruise bar crawl meet, where many of us in the group sampled some fine concoctions at a few bars around the ship. We started out at the Two Poets Pub and made our way to R-Bar, Boleros, Schooner Bar and the Sky Bar. A fine time was had by all! I managed to sneak in pre-dinner at Izumi. I opted for crispy spicy tuna with an eel sashimi. I then combined the two and it was amazing. Eating it on my balcony may have contributed to it tasting even better. It is formal night tonight, so I collected my daughter from Adventure Ocean and then it was back to the room for showers all around and getting our hair done (mine takes especially long to make perfect). For us, formal night represents the best opportunity for family photos and we take advantage of the opportunity. After taking some nice family photos, we checked out the Concierge Lounge for the first time. The Concierge Lounge is for suite guests to enjoy, similar to the Diamond Lounge. It is smaller, but a very nice spot for meeting friends. And like the Diamond Lounge, there are snacks and complimentary drinks served. Tonight was formal night, and took a formal night group photo, complete with a pinkies up fun shot! Dinner was in the main dining room this evening and a great meal. There was a red snapper on the menu that was quite good. We spent our evening at the bars along the Royal Promenade. There was live jazz music at first and then the pub guitarist returned again this evening. Love bar hopping around the ship each night! Prior to the cruise, someone asked about noise from the pool deck above us. No issues with noise above us sleeping last night, and even on the balcony, you do not hear much. The noise and music tends to go up, and so I can vouch for it being quite lovely out here. Each evening during the Diamond members reception, the Viking Crown Lounge area is closed off for exclusive use of Diamond members as a spillover space. Evidently there are a lot of Diamond members onboard. 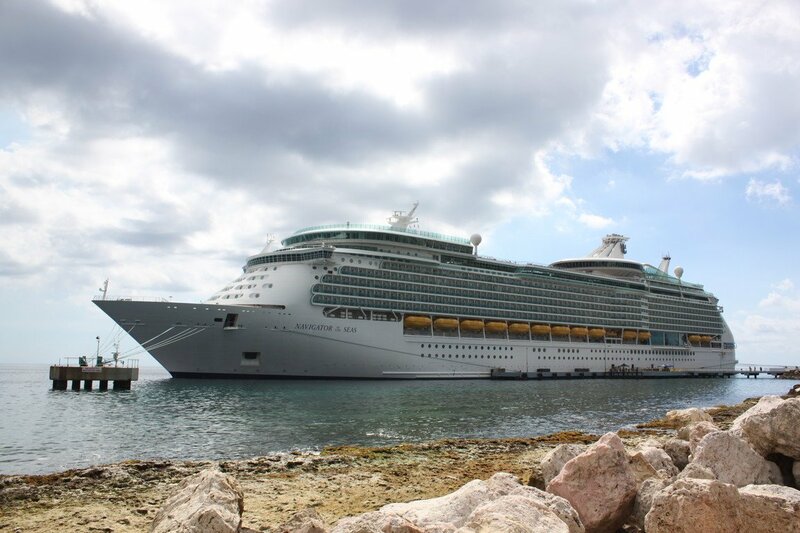 Tomorrow is our first port stop at Royal Caribbean's private destination of Labadee. Excited to return to paradise! Our nine-night Navigator of the Seas adventure is about to begin, and each day I will be sharing with you a look at the fun activities, highlights and events from our time onboard. I am a big proponent of arriving to your embarkation port at least a day in advance of your cruise's departure date and my family followed this mantra by packing up the car and driving down from Orlando to Miami. We spent the night at the Hyatt Place Miami Airport East. As the name implies, it's near Miami International Airport and about 20 minutes by car to PortMiami. The hotel was new, had a modern look and feel and struck me as a business traveler hotel that felt akin to the types of hotels I had stayed at near Newark Airport in the past. Our room was a nicely furnished suite, with pull out sofa bed for the girls to sleep in. We had arrived in Miami around dinner time, so we did not do much in the way of touristy activities. The kids showered and played, and later in the evening, met up with some friends who are joining us on our cruise. There was a large group of folks in the RoyalCaribbeanBlog.com Group Cruise staying in this hotel, and we hosted a mini get together in the lobby, complete with Papa John's pizza. Nothing but the best. I usually sleep terribly on the night before the cruise begins, and this time would be no different. I managed to fall asleep easily enough, but woke up from one of the kids fussing a few hours later and that was it for me. As usual, the kids woke up early and we got our things together to make our way to PortMiami to meet Navigator of the Seas. We made a few pit stops for gas (so that we do not have to stop before going home) and cash (tips, use onshore, and investments in the casino) before arriving at PortMiami at just around 10am. The drive was easy despite some light traffic. I believe the way the ships are lined up makes PortMiami the best spectacle of a cruise port that I have been to. There is no industrial look to this port area. We first dropped the luggage off at the drop-off area, and then parked the car at the PortMiami parking garage across the street. I know it costs much more than some off-site options, but the convenience factor is important to me when it is time to get to/from the ship. The security line did not open until 10:30am, but being in the suites/Pinnacle line meant we were among the first to get through the line. The check-in process was seamless and we had a brief wait in the Diamond lounge before we were onboard quite quickly, right around 11am. The Windjammer did not open until 11:30am, so we hung out by the pool deck for a bit because the weather was wonderful. Once the Windjammer opened, it was the great spread of food I always look forward to enjoying on embarkation day. The staterooms opened at 1:15pm and we got our first look at our Grand Suite on deck 10. The room is massive, and the bathroom might be the real highlight. We also have a connecting standard balcony stateroom next door, so we have plenty of living space. My wife thinks the bathroom size is the best part of the room, although I really like the extra-large balcony. Next up, we went to register the children at Adventure Ocean. The staff indicated there were not a lot of kids on this ship. In fact, at the Nursery they let us book as much time as we wanted for the cruise. Our afternoon mainly consisted of enjoying the beautiful weather and letting the kids catch up on some energy. The youngest managed to squeeze in a nap, but the oldest was not having any of that. Following muster drill, we went up to the pool deck to enjoy sailaway with our friends onboard. It was an absolutely beautiful day for sailaway with the sun shining, cool breeze and low humidity. Probably one of the best sailaways in a long time. We went back to the room to get ready for dinner and I called to Izumi to enjoy Izumi Express, which is essentially a take-out option. I ordered from the menu and went up to Izumi to pick it up to bring back to enjoy in my room. While waiting, the staff offered me a hot bowl of miso soup while the chef's prepared the sushi. Big shoutout to chef Jonathan for a job well done! I brought my sushi back to the room to enjoy on my balcony, and let me tell you, this is such a great way to start my cruise! Dinner tonight was in the main dining room. The vegetarian Mexican dish on the menu was really tasty! We spent the rest of the evening at the Two Poets Pub with the muscic of Danny Rodriguez. He has a great attitude and put on one of the better pub shows I have seen in a long time. Check it out, it's Royal Caribbean's headquarters with Empress of the Seas parked out back! I think Miami is the nicest looking cruise port I have been to, in terms of it not looking industrial at all and the Miami skyline is amazing. The brewed coffee at Cafe Promenade is now using Illy coffee beans instead of Starbucks. The internet onboard is certainly not as fast as some other ships, like Anthem or Harmony. It is fine for some basic browsing and whatnot, but even uploading the photos in this blog post took a good 10 minutes. Hoping for some improvement as the cruise continues. I think today I managed to get in around 6 or 7 alcoholic beverages, a macchiato and an espresso shot. Off to a good start with the unlimited drink packge! Tomorrow is our first sea day, and our first full day onboard. Should be a great opportunity to explore the ship some more and get to spend time with the friends joining me on this group cruise. Day one was already a blast and I cannot wait for tomorrow! Royal Caribbean's Navigator of the Seas has been a favorite cruise ship of mine since I first cruised on her in 2014, and it is time once again for me to return onboard for what I am certain will be an amazing journey. 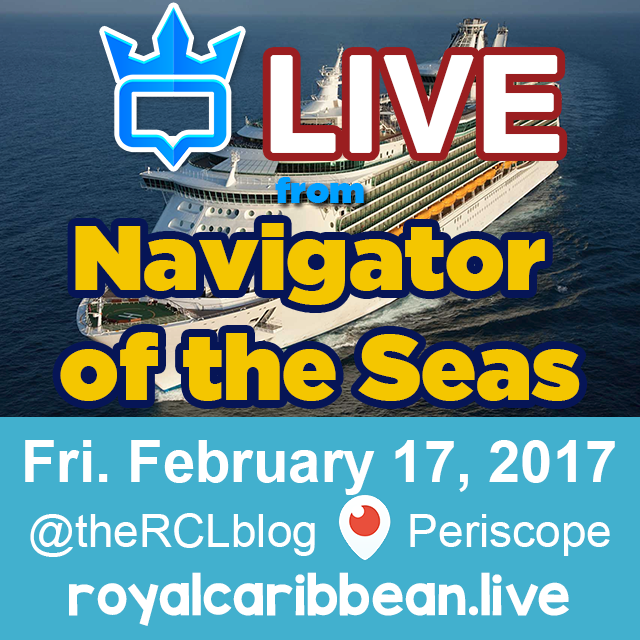 My cruise on Navigator of the Seas coincides with the first Royal Caribbean Blog Group Cruise of 2017, with a great group of fellow Royal Caribbean fans as we enjoy a 9-night journey to the Southern Caribbean from Miami, Florida. Throughout the cruise, I will share a daily update of everything I did onboard to provide you a "virtual" escape with me. As mentioned earlier, this is a long 9-night cruise that will take me to a destination I love and three ports that are brand new to me. Anytime I get a chance to visit somewhere new, it is a real treat. The story of booking this cruise goes back a few years ago when I was looking for a group cruise idea. 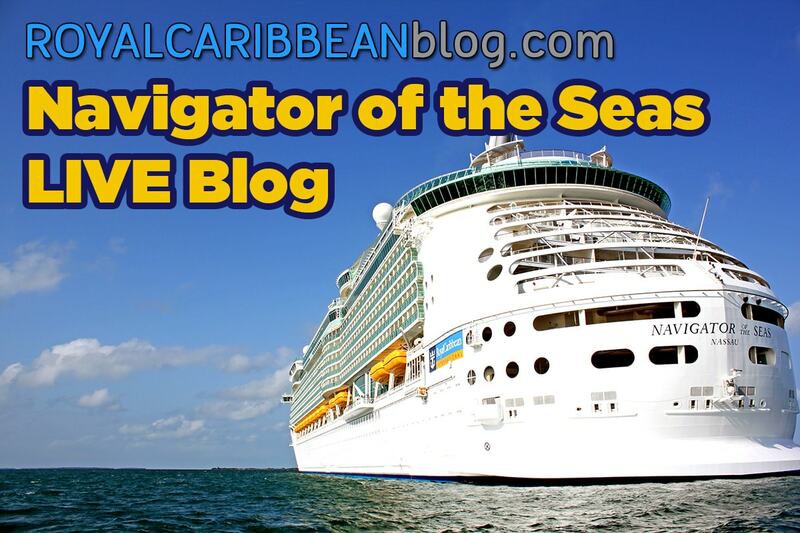 If you are new to Royal Caribbean Blog, it is important to mention my name is Matt, and I run Royal Caribbean Blog. Twice a year, I put together a Royal Caribbean cruise plan, where I invite everyone who enjoys reading Royal Caribbean Blog to join me on a cruise together. I figure everything is better with friends, and we fellow Royal Caribbean fans love nothing more than any excuse to book another cruise. This sailing stood out to me for two reasons. First, it is aboard Navigator of the Seas, one of my favorite Royal Caribbean ships in the fleet. 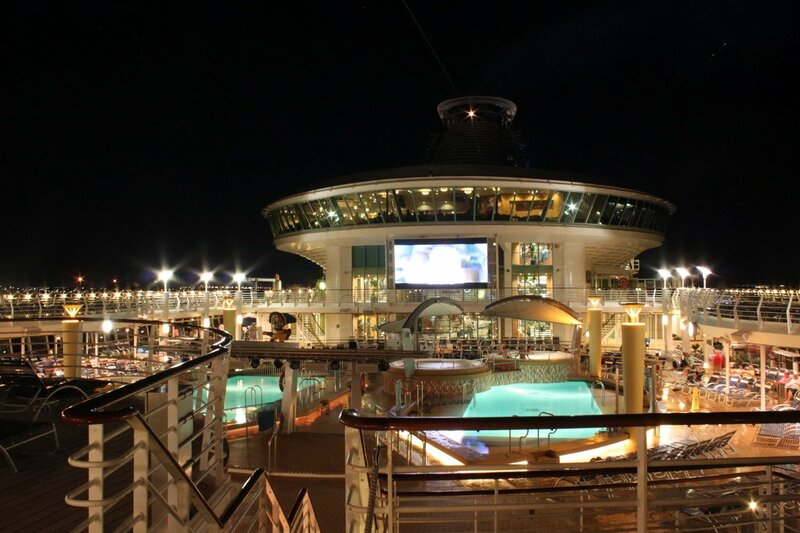 Royal Caribbean refurbished her in 2014 and added a number of new options and I loved it all. Navigator is large enough to be a "big ship," but she still retains a lot of character and I have been lucky enough to sail on her twice. With lucky number three, we get a chance to spend more time onboard and this time, bring friends. We started planning this cruise back in December 2015, so it has been a long time coming to be able to finally get onboard. The other really intriguing aspect to this sailing is the itinerary. We sail out of Miami, Florida (a port I have never sailed out of), and will visit Royal Caribbean's private destination of Labadee and the ABC islands (Aruba, Bonaire and Curacao) in the Southern Caribbean. 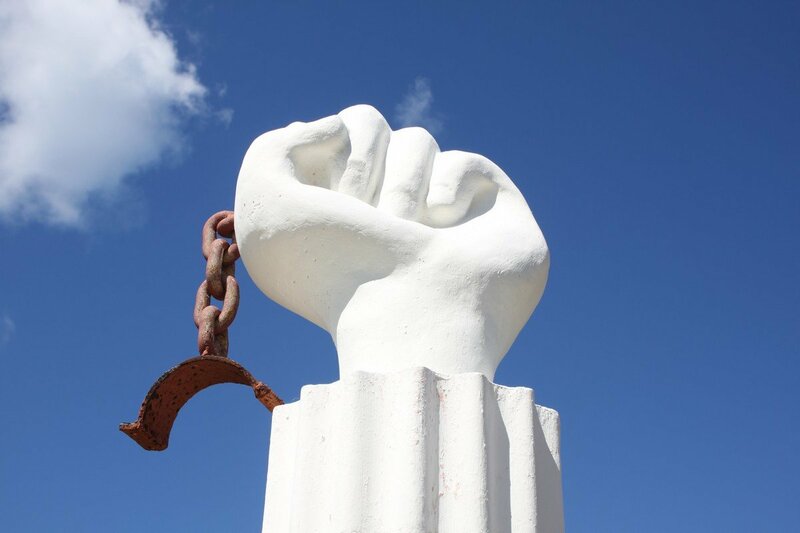 It is rare to get the opportunity to sail to the Southern Caribbean from the mainland United States, and the timing worked out perfectly over President's Day holiday. I will be sailing with my wife and two children, who are 2 and 6. This will be my oldest daughter's first time in the Explorer's room of Adventure Ocean and she is very excited to try it out. My youngest daughter will be spending time in the Royal Tots and Babies Nursery, and she has already told us she is excited to "play with the babies" onboard. Of course, this is a group cruise too, which means we have a large contingent of fellow Royal Caribbean fans joining me and I could not be happier. There is just something so fun about seeing friendly faces all around the ship, and being able to share in the experience in person is second-to-none. We reserved two staterooms for this cruise, one for my wife and I and one for my kids. I love my children and enjoy cruising with them, but we have learned that when it comes to sleeping and children, it is ideal to have a second room. Plus, it provides an additional full bathroom. For this cruise, we have reserved a Grand Suite and connecting standard balcony room. Depending on who you ask, the story of why we booked this arrangement differs. I will offer both and let you decide. My account of the booking: Being the loving husband that I am, inbetween sweeping the floors and preparing another gourmet meal for the family, I suggested to my wife she should get, nay deserves, a suite for once. After we could have danced all night in jubilee, we happened to find the perfect suite option that provided me and my wife the opportunity to book a Grand Suite and the kids in a connecting room next door. My wife's account of the booking: She was fine with two balcony rooms, but it was all my idea to book the room, which proves it is better to ask for forgiveness than permission. Whichever tale you prefer to believe, the bottom line is we are staying in our first true suite on any cruise. We have stayed in a Junior Suite on multiple occasions, but never the real deal. We happened to book this cruise under the then-epic Cyber Monday deal of 2015, which netted us quite a bit of onboard credit on top of the great rate. Our concierge emailed me this past weekend with the usual welcome letter (shoutout to Nadja), and we are really excited to see what a suite experience is all about. Personally, I am looking forward to the smaller perks which I think will make a big difference. Namely, the reserved area for suite guests near the pool, priority embarkation and private beach in Labadee. As excited as I am about the ship, where we are sailing is even more impressive. A blend of sea days and port days, we will get a chance to explore a part of the Caribbean I have yet to see. Being a nine-night cruise, this will tie my longest cruise ever, and provide us plenty of time to explore onboard and on shore. I love Labadee because of the absolutely beautiful serenity this private destination offers. I am also a self-described cabana junky and on this cruise, we will be trying out the Barefoot Beach cabanas. The fact of the matter is I did stay in a Barefoot Beach cabana once many cruises ago, but that was not as a suite guest and I barely remember it. There are a few cabana types to choose from in Barefoot Beach, and we opted for the Beachfront cabana, which I hope will provide my kids easy access to the ocean. Plus, it looks to be a great spot and the same cabana experience we have come to love. Yes, the cabanas are pricey, but given the price breakdown of how much it costs per person, per hour over the course of the day in Labadee (and the privacy and service), it is worth every penny in my opinion. Royal Caribbean created a new shore excursion option just about a year ago, where guests can create customized shore excursions to do what they want, without having to compromise on the benefits of taking a Royal Caribbean shore trip. It is called Private Journeys, and in the name of research, I decided to try this out for myself. 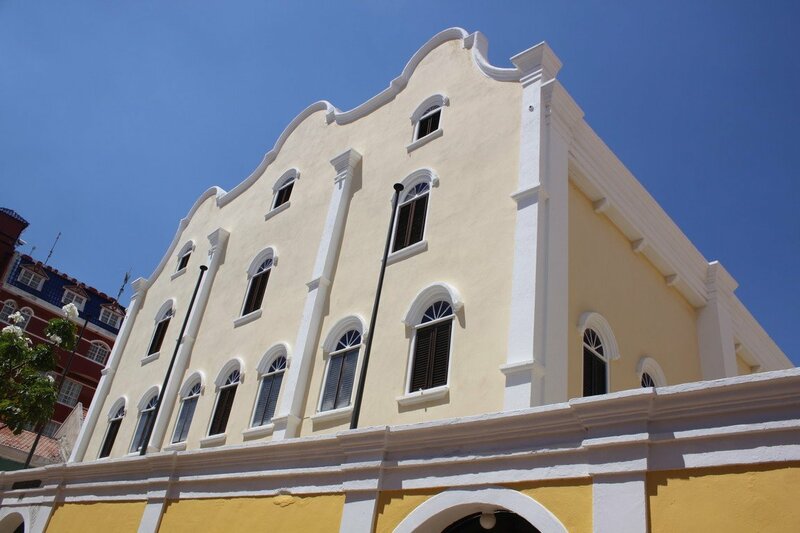 While in Curacao, we booked a Private Journeys trip to take an historical tour of the historical and cultural Jewish sites of the island. 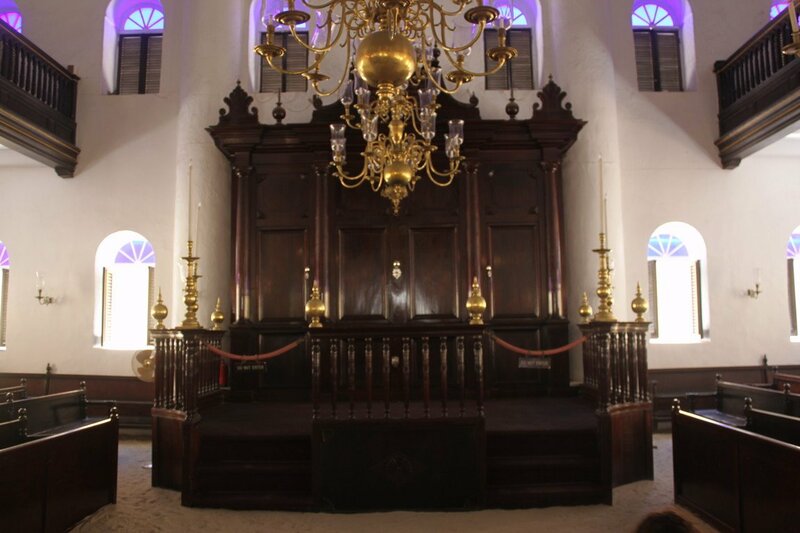 The tour includes private transportation with our own private guide to visit historical Jewish locations, such as the Jewish Cemetery, Mikveh Israel Emanuel Synagogue with photo stops at Jewish village Mahaai and New Ashkenazi Synagogue. I will post a full review of experience with Private Journeys, but we are excited to try out this new service and discover some really intriguing historical landmarks. I would be remiss if I did not say I am really excited to finally be able to stay in a suite on our cruise. My wife and I have dreamed about staying in a suite for a long time, but we were never able to jump at the chance. This time, we managed to make it work and it is really exciting. Personally, I am most interested in taking advantage of the subtle benefits, such as reserved chairs by the pool and in the theater, priority embarkation and disembarkation. I think it will be a nice change of pace for this sailing, and with it being an even longer sailing than normal for us, we get to enjoy the suite just a little bit more. Our Navigator of the Seas cruise begins on Friday, February 17th, and I will be sharing the details on the blog, as well as across my social media channels. Be sure to follow me on Twitter, Facebook, Instagram and Periscope for live updates throughout the day. The last day of our cruise is here, and it is another sea day. I wanted to take this blog post to look back on our 8-night adventure and share some thoughts on the cruise experience. If this is the first live blog post for this cruise you are reading, I suggest stopping and going back to read the other live blog posts first, to provide context. I wanted to start with Adventure Ocean because this is by far what provided the biggest WOW factor to me. Time and time again, I am impressed by the Adventure Ocean staff for the sheer amount of programming they offer and the staff's passion for the kids they watch. These are not a bunch of adults, sitting in a corner talking to each other and occasionally breaking up toy fights. The Adventure Ocean staff really enjoyed interacting with the kids and playing with them. They learned the kids names and I really felt like they cared. Both the Nursery and Adventure Ocean programming amazes me and any family considering a Royal Caribbean cruise should not worry one bit about kids programming onboard, because they do a phenomenal job. The entertainment that was offered was usually pretty good, and I enjoyed the evening shows, performances and activities the entertainment staff planned. Great stuff. What was odd about the entertainment was the scheduling. It felt like there just was not as many activities as I recall on other Voyager or Freedom class ships. There were sea day afternoons that felt like we were in port, and evenings where it seemed like they could have offered more. Again, what they offered was great and the Broadway reveue, ice show and bar entertainment were great. I would have preferred to have seen some more activities, namely trivia, as well as a classical music group. 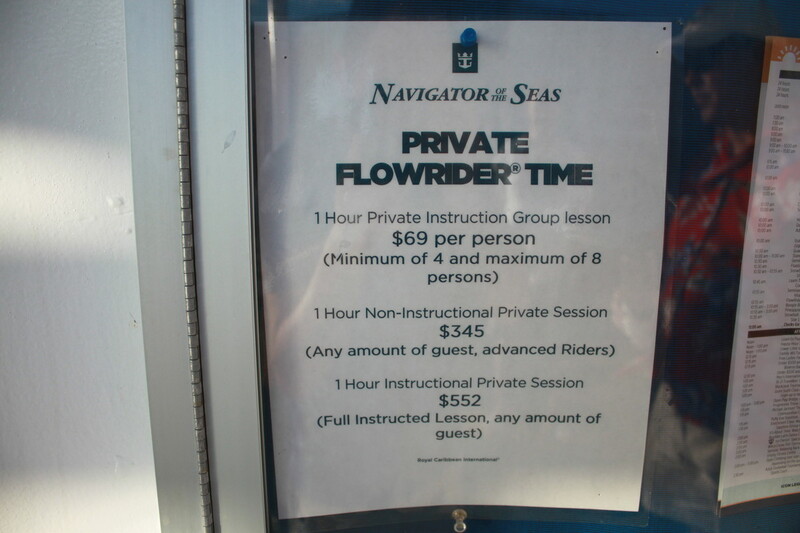 I also believe a great deal of what Navigator of the Seas offers are on-your-own activities, such as the FlowRider, mini-golf, pools, rock climbing wall, ice skating, etc. Special recognition to guitar player Jimmy in the pub, the ice skating team and the live band that played the pool and Promenade. Worth seeing any of them, all the time. The food in the main dining room, Windjammer and various other spots was all quite good. I have always said food is such a subjective thing, and something you absolutely love, I might absolutely hate. Neither of us are wrong. The food on Navigator of the Seas ranged from "average" to "very good/excellent" and I think overall, Royal Caribbean does a great job with what they offer. The breakfast eggs are still inedible (that is a fleet-wide problem), but the omelet bar makes up for it and there was a good variety of food for lunch and dinner. In addition, crowds were never an issue with any dining venue. At worst, Windjammer between 9-10am would be busy, but never unbearable. Our main dining room waiters were great and our waiter might have been one of the best in terms of service. 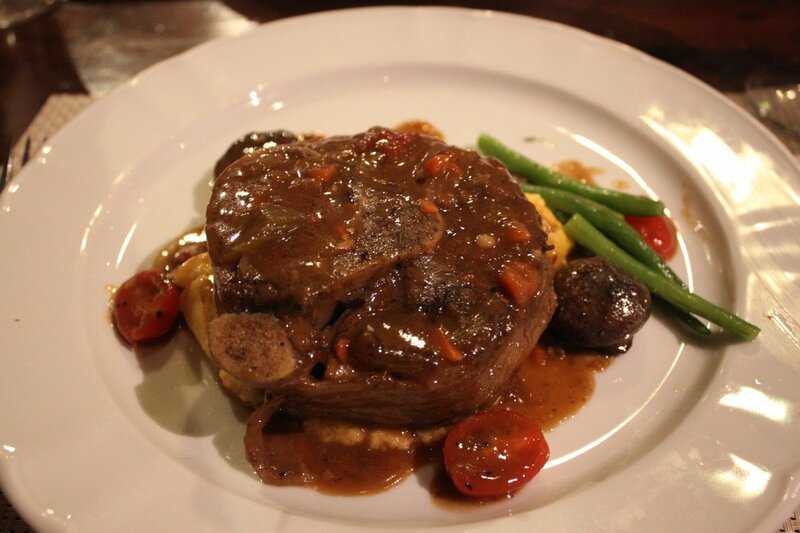 We ate at three specialty restaurants during this cruise: Giovanni's Table, Sabor and Izumi. 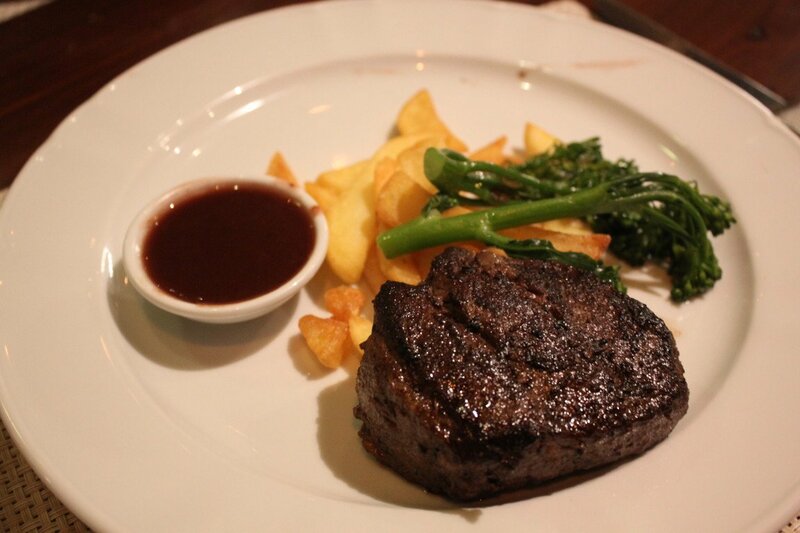 All were great and serve up really good food and present excellent values. Royal Caribbean is a market leader when it comes to specialty dining and their restaurants are not just another revenue stream. Rather, they offer fantastic food choices that are well worth your time and money and frankly, if you are not trying at least a couple of them on a cruise, you are missing out. A major factor in picking this cruise was the itinerary and the ports did not disappoint. If I was in charge, I would have changed up the itinerary slightly just to smoothe things out. We were in Labadee from 7am - 3pm, then San Juan 2pm - 9pm, then St. Kitts 9am - 6pm and St. Maarten 10am - 5pm. What I would have done is stuck a sea day between San Juan and St. Kitts and then extended our San Juan stay until like 2am or some other late hour that would allow guests to really enjoy San Juan's nightlife. Not to mention, four port days in a row is tough and by St. Maarten, we were exhausted. Nonetheless, I would take this itinerary again in a heartbeat. Great variety of ports and they all were quite lovely to visit. This was our first cruise as Diamond members and we were pretty excited to take advantage of it. There are two benefits that stood out to us with being Diamond members: access to the Diamond Lounge and the drink coupons each evening. The Diamond Lounge is quite nice to have and it did get busy there in the evenings. It is a nice hideaway, although with kids, we did not spend a lot of time there. I thought the drink coupons would be more useful to me than they were, probably because you are limited to a selection of liquor, wine and beers. I admit I am a drink snob and my favorite drinks are mixed cocktails that were not included. I am also not a huge drinker anyway, so I made my peace with the drink coupons. My wife, on the otherhand, liked her Bailey's on the rocks and just goes to show you different strokes for different folks. We had a Junior Suite this cruise, with all four of us in one room. The room was much larger than I was expecting, and we easily fit us all in there, even with the sofa bed that opens up and the crib. The balcony was also larger than I was expecting and I forgot how nice it is having an ocean-facing balcony. With this itinerary and great weather, the balcony was such a great perk. My wife and kids also really liked having a bath tub. With all of that said, with the kids as young as they are, we will book two staterooms from now on because of the sleeping situation. Having a second room allows the baby to sleep while the rest of us can be up and about. At night and during naps, our stateroom became a silent prison, where we all had to remain still, quiet and in the dark so that the baby could sleep/nap. 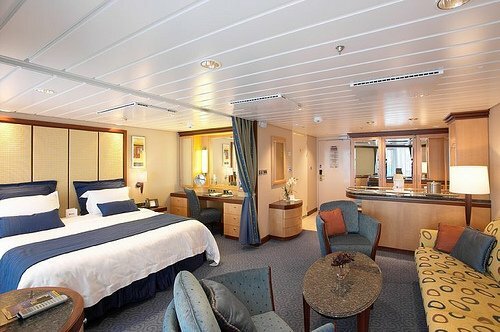 In addition, two bathrooms with two staterooms is also a huge bonus. When they kids get older and can understand the concept of going to bed with the lights still on or some other people talking, we might revisit one room. But for the timebeing, it is two rooms or bust for this family! Never underestimate the power of asking. We got luggage tags for a 9:45 departure, which is really late. A quick trip to Guest Services and we had a much earlier tag. Speaking of luggage tags, as Junior Suite guests, we had priority embarkation but do not get priority disembarkation. I could have sworn I read we had priority disembarkation too, but I am mistaken. The casino is a cruel mistress, who happens to have a lot of my money. Nursery gives parents pagers instead of phones. That is different from every other Royal Caribbean cruise I have been on to date. My oldest daughter is the mayor of Adventure Ocean Aquanauts. When she walks in, she is the Norm to their Cheers. The weather today was incredible. No humidity, sunny and temperatures in the mid to upper 70s. This kind of weather is making it ten times more difficult to say goodbye tomorrow. Having that extra day (8-nights instead of 7) is such a nice feeling and it did feel like this cruise was longer than usual. I wonder if I am one of the last Royal Caribbean guests to ever use non-Voom internet? It is very likely I had more Starbucks beverages than alcohol beverages on this cruise. Without a doubt, we had a great time on this cruise and Navigator of the Seas remains my favorite cruise ship. When you consider the value of what a cruise costs on this ship, the stateroom options and itineraries offered, I really do not think you can go wrong with this or any other Voyager-class ship. It is a great size, and getting from one end to the other was never the ordeal that it can be on other ships. The crew did an amazing job onboard and we enjoyed talking with them every day. Everyone would say hello as you walked by and they all paid extra attention to our kids. I also wanted to take a moment to say a big thank you to everyone that followed along in this live blog. I really, really, really enjoyed sharing this cruise with you and reading your comments and questions. It is still an undeniably cool concept that I can be in the middle of the Caribbean and be sharing my cruise experience with all of you, all over the world. Thank you for being a part of the fun! If you are wondering, my next cruise is on Freedom of the Seas on September 4, 2016, and you can join me for it! It is our second sea day and second-to-last day on Navigator of the Seas. For this sea day, we planned on very little. We had felt so tired from the last four consecutive port days, we were so wiped out and needed to recharge. The kids kind of slept in today, and we did not get up until 8:30am. For parents, that is the equivalent of teenagers sleeping until noon. Breakfast was up in the Windjammer and clearly we were not the only ones sleeping in. It has not been easy to find lines, but if you want to really find some, go to the Windjammer after 9am. It is then that you will find plenty of other guests. After breakfast, we went up to the Optix teen room to check out the free play that Adventure Ocean has set up there. From 9am to 5pm, there are toys for kids to play with at any time. My daughter loved having lots of toys, and for parents, this is a happy medium between paying for the Nursery and trying to keep the kids entertained on your own. My wife took our youngest for a morning nap and I headed to the Captain's Corner. The Captain's Corner is an event where you get to ask the Captain, and other members of the senior staff, questions about Navigator of the Seas. I took this opportunity to ask what the status of Voom is and why we did not get it. The hotel director essentially said that Voom was activated on Navigator of the Seas, but they were still testing it. He indicated it would likely be available for the May 8 sailing. To me, it sounds like we missed it by a day, since our cruise began on April 30. Rats! It was hot and partly cloudy outside, so plenty of guests were enjoying time by the pool. I opted to stay inside and try logo trivia. For logo trivia, we got a sheet of 50 logos to identify. We got 43 out of 50 right, with the winning team getting 45/50. So close! After trivia, we collected the children and had lunch in the main dining room. On sea days, the main dining room is open for lunch and it is a great option. The kids ate their weight in grapes. My wife went with the Tutti Salad and I ordered a couple of dishes from the menu. And they had coffee ice cream, so my day was made! We let the kids play in Optix some more following lunch and then we all split up again, with the oldest back in Adventure Ocean, while the youngest and my wife napped. I wish I had some really good stories for my afternoon, but it was mostly comprised of walking around and checking various things out. I kind of wish I had just picked a spot and maybe taken a nap or at least just listened to some music, but I enjoyed walking around the ship and taking it all in. I headed back to the room earlier than usual so that we could all get ready for dinner. We had hoped to get the kids dressed up for formal night, but the kids were not exactly cooperative so we figured it was easier to just let them be. I had booked pre-dinner this evening at Izumi and for this time, I wanted to try something different. Usually I get just sushi, but I opted for a salad... and some sushi. I picked the Ahi and Albacore Tataki Salad, partly because it sounded good and partly because it was listed on the menu as a chef's recommendation. Turns out, it was really good! Great blend of fish and vegetables and the dressing added just the right flavor to it. Of course, the sushi was quite good too! We got the kids fed and dropped off at Adventure Ocean and then my wife and I headed down to the Schooner Bar for TV theme song trivia. We found another couple and played together and lost by two points. So very close! We booked dinner at Giovanni's Table tonight. We had tried to book dinner at Chops Grille, but they said they were booked solid. Giovanni's Table just had one seating available, so we took it. This was our first time having dinner at Giovanni's Table in quite some time, so I was excited to try the dinner menu again. Overall, the food was great and their dinner menu is quite good. Definitely need to stop here more often. Tomorrow is our last day and it is a sea day. In addition to the usual summary, I will wrap up our cruise adventure with some thoughts on Navigator. I spotted some new drink specials at various bars today. Very agressive pricing, which is great for those of us not on the drink package. There is a cancellation policy for Izumi if you do not cancel within 24 hours. Not sure about other restaurants, but worth noting. I have learned the key to taking advantage of those free drinks you get when you reach Diamond status is to start early. 4:30, not 7:00 is how the pros do it. I believe someone asked about the view from the gym. The gym is on deck 11, so it still has a view out (although the ship's bridge somewhat blocks it). While waiting for Giovanni's Table, there was some private dinner function going on in the closed part of the Windjammer, but was being served by crew members and the table looked fancier than just another Windjammer meal. No clue what it was about. We are in St. Maarten today, and it is our last port to visit on this cruise! Navigator of the Seas arrived in port right on time and we were across the dock from Freedom of the Seas. Independence of the Seas and a Carnival ship were also in port with us today. This was the only day where we had any other ships in port with us, which is kind of odd. We got ourselves ready and gave the kids just a banana and some milk to start with because we wanted to have breakfast/brunch on the island. We disembarked and walked through the port area to find our driver. We made a pit stop for sunglasses, because the youngest broke my wife's sunglasses the other day. Sadly, we had to find the first souvenir shop we could find and pay the $15 asking price for them. C'est la vie, I suppose. We had made arrangements with a driver named Leo Brown prior to our cruise to drive us around for the day. Leo is someone we met many cruises ago and have used every single time in St. Maarten, because he is knowledgable, well-versed on what is available to see/do/eat/experience on the island and very reasonably priced. We met Leo at the entrance to the port and we were off. We made a quick pit stop at a supermarket on the Dutch side to pick some cheese and drinks. We then headed to the French side of the island and to Marigot, to have some breakfast. Leo brought us to this wonderful French bakery, where they had amazing freshly baked baguettes, croissants and other pastries. We ate it with the cheese we picked up earlier in the outdoor seating area, close to the ocean. Magnifique! We walked around Marigot a little bit, and stumbled on an outdoor market, where we perused the various items for sale and got the girls some ice cream to cool down. Next, it was back in the car to head to the beach. We made a pit stop at Friars Bay to see the beach there. It looked lovely, but we wanted a beach that was a better fit for the kids. We drove to Le Galion beach, which is a beach that is a protected cove, which means there are no waves. The beach is beautiful, and you can get a beach chair and umbrella for 5 euros each. The reason we go to Le Galion is because the ocean is so calm here, the kids can run in and out of the ocean without concern of a wave knocking them down. It is also super shallow for a long time, so our 5 year old can wade deeper than usual. It was a great time playing, but the kids started to get tired so we packed into the car. Our plan was to grab something to eat before going back to the ship, but the kids fell asleep in the car, so we just had Leo take the long way back to the ship to let them nap a little. We bid adieu to Leo and thanked him for his services once returning to the port. It was then back on the ship for Sorrentos Pizza and showers. Back on Navigator of the Seas, I was very hungry and decided to not only have something to eat, but enjoy a classic Royal Caribbean dish. I ordered from room service the honey stung chicken. It may be gone from embarkation day lunch menu at the Windjammer, but its legacy lives on in your staterooms (20-45 minute waits at a time). After showering and getting dressed, I took my oldest daughter for ice skating in Studio B. It was her first time skating and I am not sure she really loved it, but she did not fall once (thanks to a death grip on my hand). We dropped both children off at Adventure Ocean and then made our way to deck 4 for an all-time favorite. For our pre-dinner drinks, we grabbed a drink at R-Bar. Seeing as it was Cinco de Mayo, we had made reservations at Sabor Modern Mexican. My wife made reservations online months ago and for good reason, considering the place was packed. 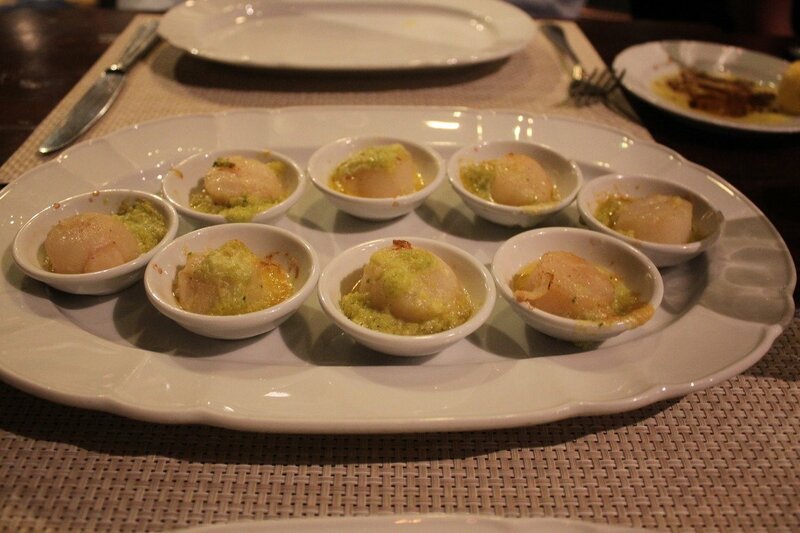 We have enjoyed Sabor on every Royal Caribbean ship it had been offered and have loved it. Amazing food, highlighted by even better guacamole. One aspect that is wonderful about Sabor on Voyager- and Freedom-class ships versus Oasis-class ships is there are select margaritas that are hand-crafted in front of your table. These are really great and were the perfect value for my handy, dandy drink card I purchased yesterday! The meal was amazing and I ate much too much, but loved every bite of it. Given all the fun we had in St. Maarten, lack of naps, and ungodly amount of food consumer at Sabor, my wife and I were really feeling quite tired. We collected the children and called it a night early so that we could start tomorrow fresh (fresh is like 11am, right?). Tomorrow is a sea day, and only our second sea day since day 2. Seriously. Marigot has some great food and I would love to have spent more time there. Leo informed us much of the Dutch side was closed today, because there was some holiday. There was literally not one empty table at Sabor tonight. Clearly, Cinco de Mayo is a big deal, or at least a pretty good excuse to try Sabor. Knee pads are provided in addition to helmets for guests doing ice skating. The SeaPass card readers have the option for WOWBands. I suspect it is more a coincidence that the POS provider Royal Caribbean partners with offers one model to all ships than a hint of what is to come to Navigator of the Seas. But I could be totally wrong. No naps, no casino visits and no Diamond drinks. Clearly, Bizarro Matt is here. Welcome to the island of St. Kitts, which is our third port stop and it is my first time here. We were scheduled to arrive at about 10am, so there was not much rush this morning. The 1-year-old woke us up too early again, but we did get a chance to enjoy the view of us sailing into St. Kitts from the comfort of our balcony. Prior to disembarkation, I made a Starbucks run and noticed a sign at Cafe Promenade advertising the rarely seen, but often discussed, drink card! These drink cards are special promotions that a particular Royal Caribbean ship will offer on a particular itinerary, but there is no way to know or guarantee it will happen on your sailing. 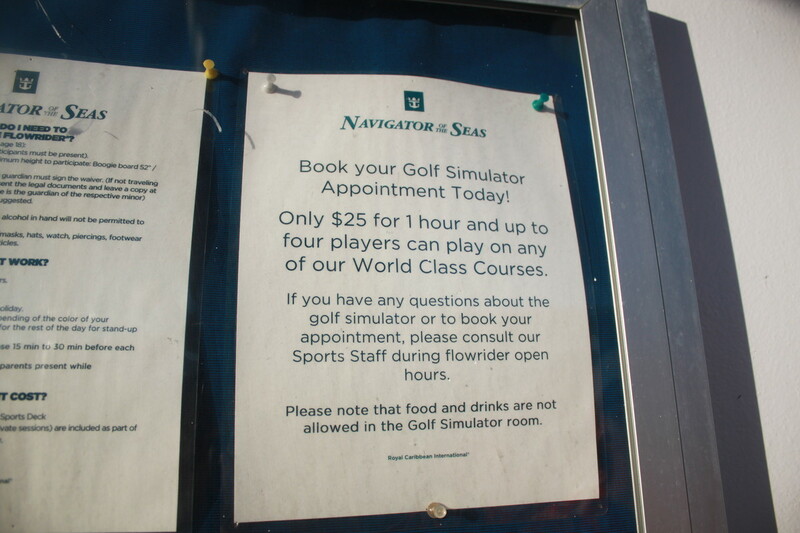 Essentially, the ship's revenue manager will want to boost revenue and offer a drink card. The drink card costs $80 and that gets you 10 drinks (beer or wine), including gratuity. You can share the drink card and use it just like the Premium drink package. It basically works everywhere, except for room service, mini-bar and does not include some of the crazy-expensive liquors. I am generally not a fan of the unlimited drink packages because I, personally, cannot drink enough to "break even" on them over the course of the cruise, but a 10 drink card that I can share with my wife is a no-brainer. That means all my drinks will cost $8, and with most cocktails at $10-12, it will be easy pickings for me! Once we were docked, we headed off the ship for our excursion. We had booked prior to the cruise the scenic railway excursion, where we would tour part of St. Kitts on an old train that used to be used for transporting sugar cane. The excursion cost $109 per adult ($59 for kids, the 1 year old was free) and we boarded a bus to bring us to the train. The bus driver gave us a tour of the island as we made our way to the train, giving history on the island as well as pointing out various points of interest. You will board the train at one of two positions, depending on where the train happens to be from the last ride. 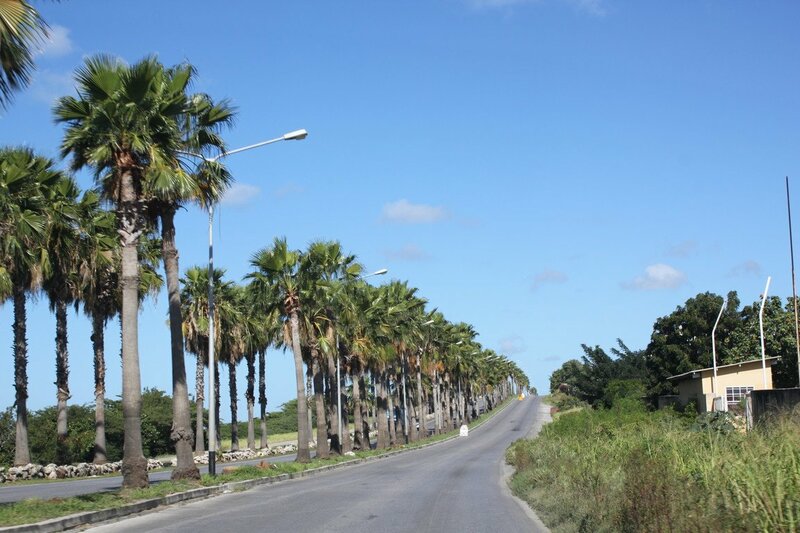 I will write up a formal review of the excursion for a future blog post, but essentially, you tour the countryside by train and get a chance to see a lot of the parts of the island that many excursions do not go. Also included in the excursion is unlimited mixed drinks, sodas and water. We picked this excursion because it was something completely different than we had done before and we thought it would low-impact for the kids. I think the kids enjoyed it, not sure it was their favorite thing ever either. The one-year-old got stir crazy by the end and scenery is largely lost on her, but overall it served its purpose of doing something different. We returned to the port area and I did a little perusing around the port area. We left the port area for a bit, but unlike Cozumel or Grand Cayman, there was not a whole lot that I could find that a tourist would find worthwhile purely on our own while walking. 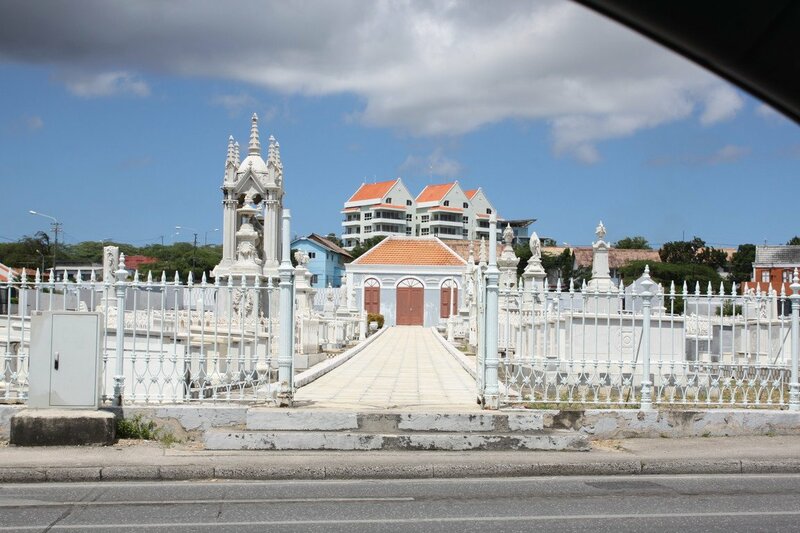 I would like to return to St. Kitts so that we can do more exploring of what there is to do. I think next time we will do more of a potpourri approach, hiring a driver, and checking out a few quick spots. Back on the ship, it was nap time and Adventure Ocean time for the kids. As afternoon turned to evening, I was compelled to try something new, yet still old. I noticed the other day there was an "Izumi to go" option and wanted to try it out. Essentially, it is take out sushi that is available, where you call Izumi, order anything off the menu and then go to the restaurant to pick it up. I could see a variety of reasons this would be useful, especially for evenings when being on the balcony is preferable or the kids are not in the right mood for a restaurant. I ordered my go-to DX Sushi Combo and it was ready in about 10 minutes. They will actually call your stateroom to let you know it is ready to be picked up. Hard to beat sushi on my balcony! We got dressed for dinner and dropped my youngest off at the Nursery. My wife and I headed up to the Diamond Lounge to check out what was happening there. In addition to the usual drinks, here is a look at the food available. Some nice snacking options and I really like being out in the outdoor section, where there is a nice breeze to enjoy. In the time leading up to dinner, we wandered around and tried some drinks from Boleros. At dinner, I had a cruise first when a waiter from Sabor came to our table and told us our regular waiter was sick and he would be waiting on us. We rounded out our evening with music at the pub. Jimmy is the guitarist there and is very entertainment. We had a very nice moment this evening, when we picked up my 5-year-old from Adventure Ocean and they had a backpack full of goodies for her as a present. They said it was "for being cruising with them so much", but it was such a kind gesture. The Adventure Ocean staff, both in the Adventure Ocean and the Nursery, are the hardest working folks I see on any Royal Caribbean ship. They genuinely care about the kids and their well-being, and we have had such excellent crew members over the years. Tonight was just the icing on the cake. Tomorrow is our last port stop and we will be in St. Maarten. We have lots planned, so hoping everything (mostly the children) cooperates! The Cruise Compass and the Captain both told us the high temperature would be about 73 to 75 degrees today. My sweaty clothing tell a much different story. The tour guide told us there some 20,000+ monkeys on the island, but the only ones we saw were the monkeys you can pose with in the port area. The Port Zante area is similar to many other Caribbean port facilities, with tourist shops, a few bars and even fewer restaurants. The distance between St. Kitts to St. Maarten is something like 90 miles, so we are going extremely slow. I cannot remember a cruise where we went this slow, for this long a time. Someone asked about the blue car on the Royal Promenade, so here it is! We have used 3 drinks so far from our 10 drink coupon. I think it will be most useful at our specialty restaurant reservations, especially Sabor. For those keeping score at home, no naps for me today!